I've had a sneaking suspicion that Jim Lee's Legion of Super-Heroes variant covers fit together in some way. But I couldn't quite see how. The reason for that is that the covers are published out of order--in terms of historical eras. Legion of Super-Heroes #2: Superboy, 50s era. Legion of Super-Heroes #3: Chameleon Kid, 60s era. Legion of Super-Heroes #1: Saturn Girl, 70s era. Legion of Super-Heroes #5: Timber Wolf, 80s era. Legion of Super-Heroes #4: Mon-El, 90s era. 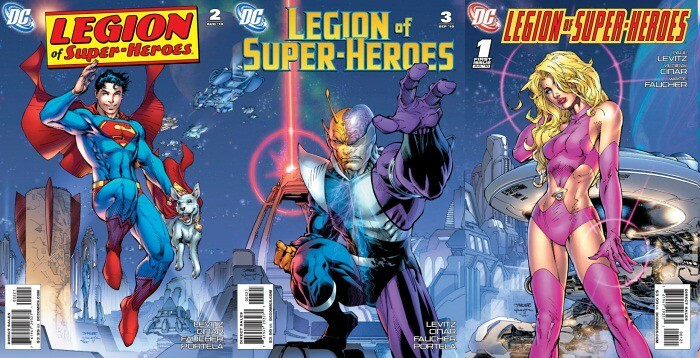 Legion of Super-Heroes #6: ? ?, 2010 era. DC Comics had better be planning on releasing this as a poster. I've already got a spot picked out for it! BTW, you can read the original discussion on this topic over on the DC Comics message boards. Nuff Said.